After the Republican marionette doll named Scott Walker that masquerades as Wisconsin's Governor signed a bill Thursday repealing the state's 2009 Equal Pay Enforcement Act and then disappeared for the weekend to perform at a few horrifying children's birthdays, a lot of Wisconsin's Democrats were understandably disheartened. Observed Christine Sinicki, a Democratic state rep. who co-authored the original legislation, "This whole session has been anti-woman and anti-middle class, and this fits right in with that agenda," none of which would shock the Wisconsin voters who successfully launched a recall campaign for Scooter after he took aim last year at collective bargaining rights for the state's public workers. According to the Daily Beast's Michelle Goldberg, though, not everyone in Wisconsin is displeased with the Governor's decision to make it more difficult for working women to bring discrimination suits against their employers. 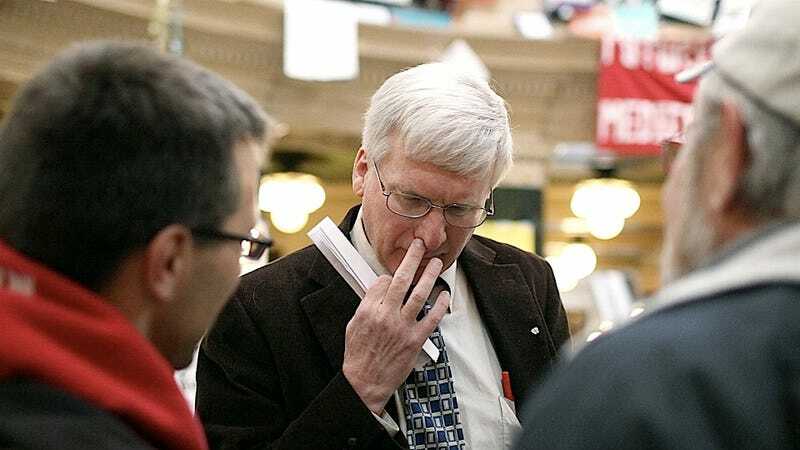 For people like Republican state senator Glenn Grothman (pictured here probably picking his nose in front of constituents and a major proponent of the repeal effort), not only was the Equal Pay Enforcement Act burdensome to those poor, beleaguered businesses who no doubt found it impossible to both turn a profit and pay women the same — if not, gasp, more! — than their male colleagues, it went against the natural, nurturing impulses of women. Amid the piles verbal feces that spluttered out of Grothman's mouth when he was given an opportunity to defend his support of the act's repeal, Grothman offered up what we might think of as an amateur's attempt to explain sociological phenomena, that is, we might think that if anybody in the GOP believed in the sciences, social or otherwise. Take a hypothetical husband and wife who are both lawyers. But the husband is working 50 or 60 hours a week, going all out, making 200 grand a year. The woman takes time off, raises kids, is not go go go. Now they're 50 years old. The husband is making 200 grand a year, the woman is making 40 grand a year. It wasn't discrimination. There was a different sense of urgency in each person. Never mind that Grothman is one of those doughy old legislators who believes it'd be unconscionable for a woman to get an abortion — women, especially married women, don't bring in the six-figure salaries because they just can't ignore the uterine siren-call to birth enough stout children to work the homestead and replace the older siblings that have died from scarlet fever. There's no actual pay gap, he insists — it's just ladies being all baby crazy. You could argue that money is more important for men. I think a guy in their first job, maybe because they expect to be a breadwinner someday, may be a little more money-conscious. To attribute everything to a so-called bias in the workplace is just not true. You could argue that, Mr Grothman, but you'd be wrong because making money isn't gender specific — it's something all Americans, male and female, love to do.